Ever wondered what it might be like to go back in time? What would it be like to see and experience the lives of your ancestors hundreds maybe thousands of years ago? ‘Ah if only…’ one might say…or ‘Yes…but physics says we can’t travel back in time’…or ‘Time travel is a paradox’. What if I were to tell you that not only is time travel indeed possible but the time machine itself has been in existence since countless millennia? What and where would this time machine be then? Well the time machine I’m referring to is none other than …You! How is that even possible? How can you, yourself be a time machine? Well, the answer lies not in physics (a paradox in itself) but biology! The key to time travel lies in the underlying code of life: DNA. It is present in each and every cell of your body and to a very large extent determines who you are and what you are. This very same DNA can allow you to take a peek into not only the lives of your ancestors such as how and where they travelled, who they interacted with, but also possibly traces and remnants of our extinct hominid cousins: Neanderthals and Denisovans. In other words, your DNA is a living, breathing fossil record that can show you where you are coming from, your ‘many homes’ from the past and to a certain extent who your ancestors called their ‘significant other’. What this means is that your DNA contains ‘snapshots’ of your past and together with the snapshots of many individuals can give an idea of the evolution of our species. 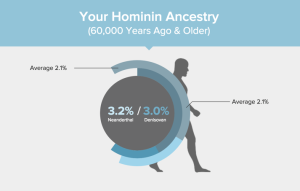 All of this is made possible by revolutionary advances in the field of population genetics whereby researchers study each individual bit of information in the DNA: the nucleotides Adenine(A), Guanine(G), Cytosine (C) and Thymine(T) and analyze their inheritance patterns across different population groups from across the world. The principal idea is to trace stable mutations in these nucleotides down several hundred to thousands of generations. What are mutations? Well, broadly speaking, every time a sperm and an egg form, the genetic material of the individual is copied into them. Occasionally, however there are some ‘errors’ as the copying of genetic material is not 100% foolproof. Most of the times, these ‘errors’ are harmless and as there is no evolutionary pressure to eradicate them, they tend to persist. Population geneticists are now able to trace such ‘errors’ or ‘markers’ down the ages to different population groups from around the world. These population groups have then been compared amongst one another to trace back even further ancestral lineages. 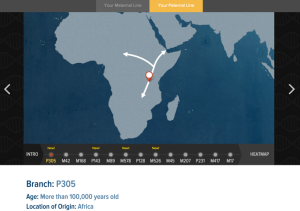 In this manner, each and every one of us can be put on a specific ‘branch’ of the human family tree or in a ‘haplogroup’. 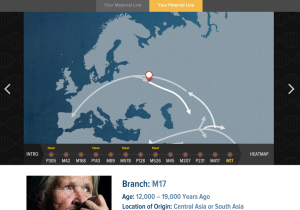 In this way it is possible to determine where your ancestors lived and who they interacted with tens of thousands of years ago. 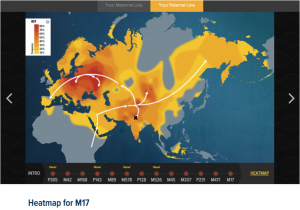 If all of this piques your interest and you are curious to find out more about yourself and your ancestors, you can participate in the ‘Genographic Project’ by the National Geographic Society at https://genographic.nationalgeographic.com/. I personally was always curious about what migratory routes my ancestors might have taken and therefore ordered the Geno 2.0 genealogy kit. The answers, as the cliché goes, surprised even me. 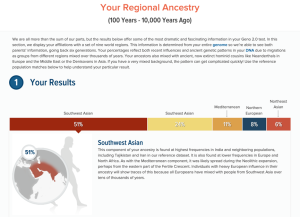 For starters, I was very surprised to learn that I was possibly related more to people from the modern day Poland area than I was to a colleague who is from the southern portion of my own country (India). 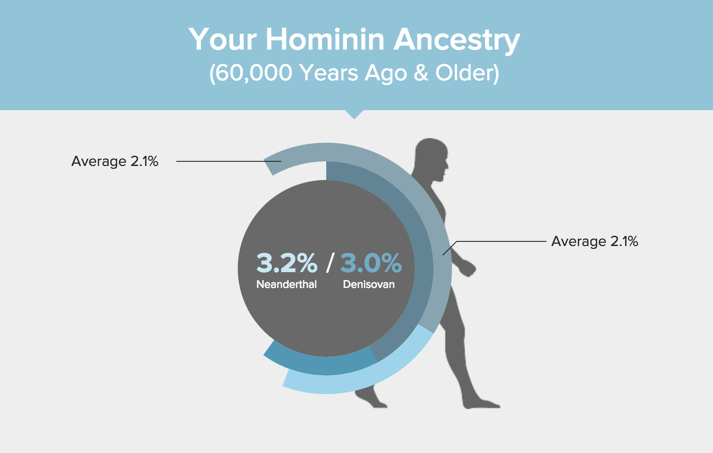 Well apparently along the way… my ancestors got frisky with other similar looking two-footed creatures a bit more than on average and I’m still carrying the proof of their peregrinations! Imagine one cold frigid day…. 15,000 years ago… two brothers or clans in the present day Balkan area. One of them decide to move farther into the frigid environs of Europe while the other brother probably thought…nah…I’m better off in the greenery and warmth of Asia and thus…two brothers walked away from each other, to not see or meet for the next twenty millennia! 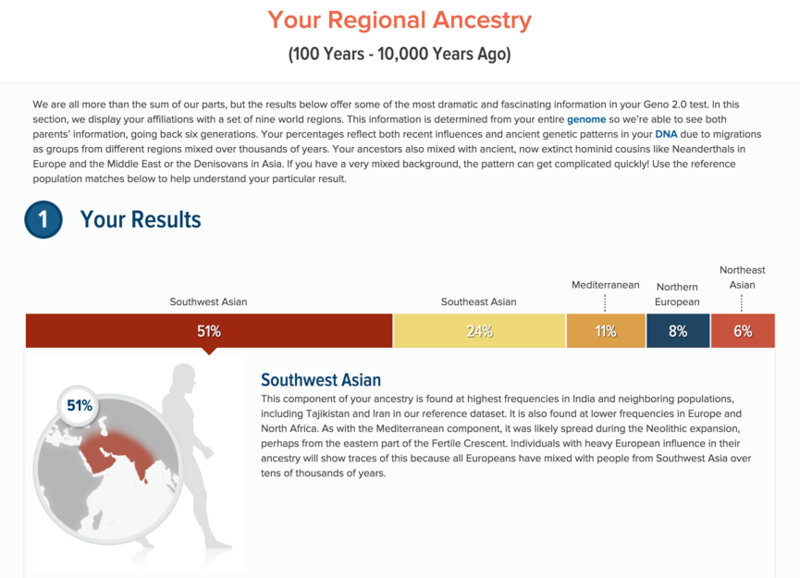 My ‘principal’ haplogroup and it’s present day spread and reach. Red depicts increased representation of the haplogroup in the specific geographic area. ‘X’ marks where I’m from presently. Broadly speaking, the higher the percentage, the older is the lineage. In other words, sometime in the not so distant past, apparently there were some dalliances with people ultimately of European and East-Asian origin! A caveat one must keep in mind about all the results is that being a female there is very limited information available on the paternal side of one’s family due to lack of Y chromosome. Hence if one is considering taking a peek into the lives of one’s ancestors, it is better to request one’s brother or father. At present, the information available on the paternal side of one’s family is far more detailed and precise than the one available on the maternal side.